Our colorcharts include dozens of speckled and variegated shades, which can be grouped into semisolids, speckled and block-dyed shades by the distribution of colors. When choosing your colorway, consider the type of multi-color shade(s) you want to use, as well as the base yarn. Pooling may happen in any project, depending on the stitch count, gauge, colorway and yarn used. Multicolor semisolids are shades with several matching hues blending into one another. They are very much like semisolid colorways with shades of only one color. Hues will blend into one another with minimal contrast in darkness and tone. 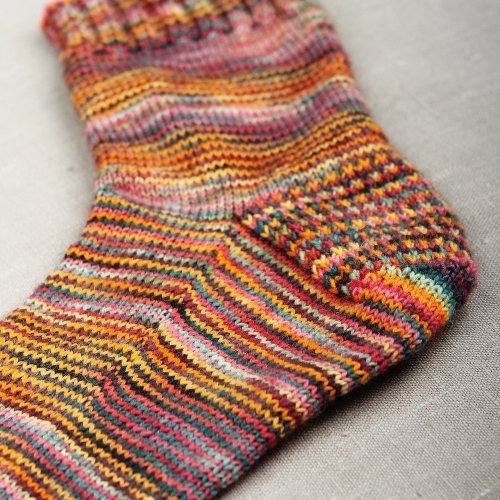 Semisolid colorways may create subtle pooling depending on stitch-count and colorway. 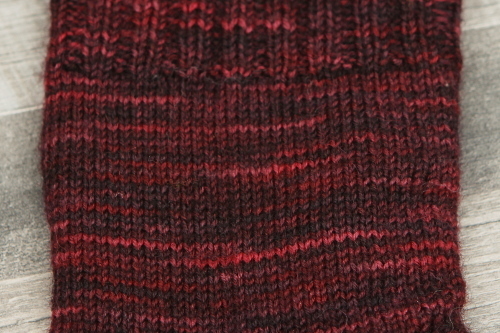 Seen below: colorway Villiviini (Wild Wine) in Väinämöinen Sock Yarn. Browse all our multicolor semisolid shades. Speckled shades are literally speckled with high contrasts between the colors. Lighter colorways are typically speckled with white. These colorways reveal their true character best in stockinette or garter stitch patterns. 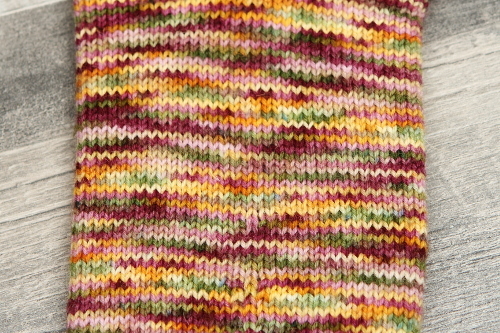 Seen below: colorway Akvarelli (Watercolour) in Väinämöinen Sock Yarn. Browse all our speckled shades. Block-dyed shades are dyed in blocks of single color, with overlapping color sections between primary colors. Depending on colorway and yarn base, these sections vary in length from 10 cm (4 inches) up to 100 cm (40 inches). Block-dyed skeins will not create broad stripes automatically but are likely to pool depending on the stitch count and yarn. Seen below: colorway Viikonloppu (Weekend) in Väinämöinen Sock Yarn. Combined with single-color semisolid shades these vivid colorways will really pop. 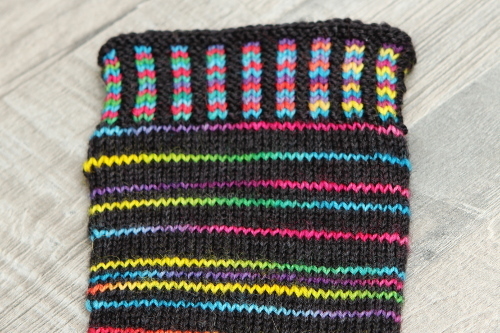 For example, combined with dark, neutral charcoal Noki (Coal), single-round stripes of Sirkus (Circus) look very dramatic. Browse all our block-dyed shades.